Although only a few damaging earthquakes occurred in Korea, about 37 minor and intermediate earthquakes occur annually, 10 of which record over 3.0 in Richter scale. Nine earthquakes having a magnitude of over 5.0 have occurred in Korea since 1978. In particular, the earthquake which occurred in Gyeongju, Gyeongsangbuk-do in 2016, with a magnitude of 5.8, is regarded as a recent example of a typical damaging earthquake in Korea. Two tsunamis, generated by earthquakes in the sea near the western coast of Japan, caused damage to the eastern coast of Korea in both 1983 and 1993. 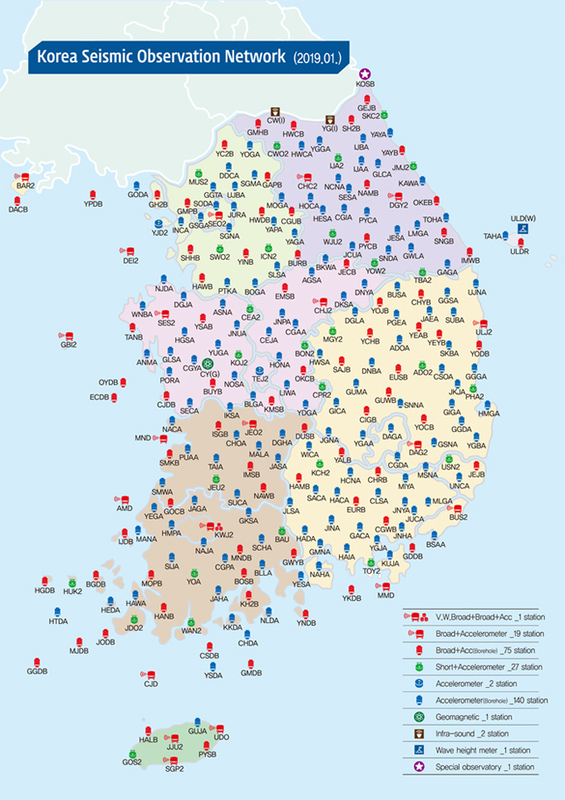 The Korea National Seismographic Network(KNSN), with 264 observations, including 95 broadband (one overlapped with very broadband) and 27 short-period seismographs and 142 accelerograph stations, was set up to monitor earthquakes occurring in the Korean Peninsula and its vicinity. More seismograph stations will continue to be installed in the near future. In addition, KMA has made efforts toward international cooperation by sharing information on earthquakes with the International Seismological Center (ISC) and neighboring countries such as United States, Japan and China. KMA has also made a leading role as a member state of the Intergovernmental Cooperation Group for the Pacific Tsunami Warning System (ICG/PTWS).